Carl Palmer, long regarded as one of the most innovative and skillful drummers in rock history and founding member of both Emerson Lake & Palmer and ASIA, is the subject of an exciting new instructional drum DVD. 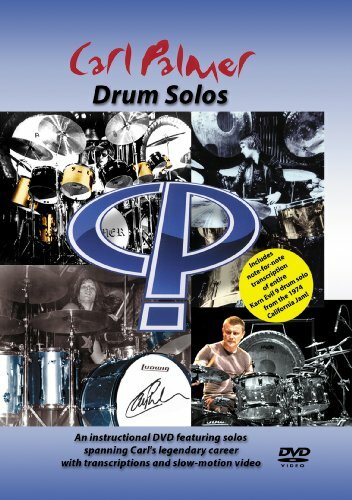 Carl Palmer, long regarded as one of the most innovative and skillful drummers in rock history and founding member of both Emerson Lake & Palmer and ASIA, is the subject of an exciting new instructional drum DVD, simply entitled, Carl Palmer - Drum Solos . Due for release on February 22, 2011, by Music VIdeo Distributors (MVD), the video is a unique note-for-note study of Palmer drum solos from the legendary Brain Salad Surgery era of ELP, through his years with both ASIA and his own band. The DVD captures three classic Palmer solos from different time eras, and presents them at three different speeds: 25%, 50% and 100%. By watching the solos in the slowest motion, drummers can carefully see exactly what Palmer is doing and how he appears to be doing it. In addition, the DVD comes with note-for-note sheet music transcriptions of each solo, which can be easily downloaded with Adobe Reader. "I have long resisted putting out an instructional drum DVD, despite many calls for it in the past, " says Carl Palmer, who currently records and tours with both the re-formed ASIA, and his own Carl Palmer Band. "However, when the idea for this video was brought to me, I immediately liked it. It enables other drummers to get inside how I have crafted and arranged my solos over the years. A drum solo is an extremely personal work of art, but others can learn from it and develop their own percussive expressions. That is what I hope this DVD will do for those who use it." The idea was conceived by fellow drummer and Carl Palmer fan, Eric Fischer, who, with long-time Palmer/ELP archivist Tony Ortiz, combed through hours of Palmer-related concert footage before settling on the ones used for this DVD. Among the performances are Palmer's immortal drum solo from ELP's 1974 California Jam television concert. Long regarded as one of the greatest drum solos of all time, it remains the gold standard by which most other rock drum solos have been judged. The video was co-produced by Fischer, Ortiz, Palmer, and Palmer manager, Bruce Pilato. MP3 audio files of the solos are also included on the disc, complete with MIDI soundtracks, so drummers can play along at the 25%, 50% and 100% speeds. Bonus footage includes a brilliant snare drum only solo, a Palmer solo from his ELP-offshoot band "3" with Keith Emerson & Robert Berry; and an extensive Carl Palmer photo gallery, featuring images from The Crazy World of Arthur Brown; ELP; 3; ASIA; and the Carl Palmer Band. "This is not an instruction in the traditional sense of the word," says Palmer, " I view it as more of an examination of my work as a drummer and percussionist, that comes with an invitation for all drummers to join in. I learned my craft studying the work of the great drummers such as Gene Krupa and Buddy Rich; hopefully, this DVD will offer that same kind of inspiration." Carl Palmer emerged on the music scene at the age of 15, playing with a number of established UK bands such as Chris Farlowe & The Thunderbirds, The Crazy World of Arthur Brown, and Atomic Rooster during the 1960s. In 1970, he formed one of rock's earliest supergroups, Emerson Lake & Palmer; and a decade later he launched ASIA, another supergroup with Geoff Downes, Steve Howe and John Wetton. He has performed and recorded in reunions with both ELP and ASIA, and also tours regularly with his own band. Since the beginning, Palmer has sold over 50 million records, and was named one of the 10 Greatest Drummers of All Time, by Rolling Stone magazine.